CELEBRATE the Year of the Rabbit for luck, prosperity, happiness and fortune at the Museum Chinese Restaurant of The Legend Hotel Kuala Lumpur. The Legend Hotel Chinese chef Loke Wan Toy and his team have lined up a special oriental Chinese New Year set menu which is a nine course meal for diners this Chinese New Year. There will be four different sets in the set menu according to themes namely Celebration, Goodwill, Prosperity and Wealth. Every dish in the nine course menu will also be according to a theme or name which is symbolic of all good things for the Year of the Rabbit. All the set menus will start off with the Prosperity Yee Sang which is under the theme ‘Prosperity All Year Round’. “Yee Sang is a popular festive dish and is a must have every Chinese New Year. The higher the Yee Sang is tossed, the more prosperous one would be,” said Loke. Traditional delight: Fried Glutinous Rice with Dried Scallops. The raw fish salad is mixed with vegetables and condiments such as sesame seeds, crushed peanuts, dried noodles cracker bits and sauces. 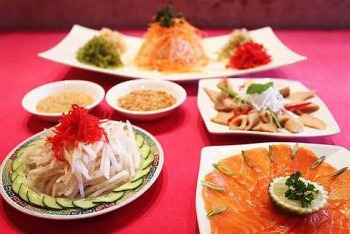 The restaurant will have a fine selection of Yee Sang available with different variations such as abalone tuna, salmon, jellyfish, dragon fruit, pear and vegetarian Yee Sang. Besides being served in the set menu, the Prosperity Yee Sang selection is also available for take away. A must-have: The Prosperity Yee Sang with abalone and salmon. 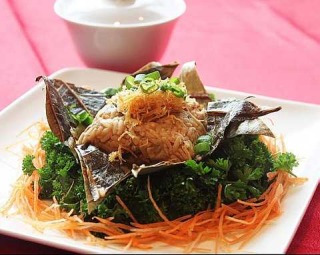 The Yee Sang will be followed by another customary dish for Chinese New Year which is Braised Superior Shark’s Fin under the theme ‘Fame and Recognition’. 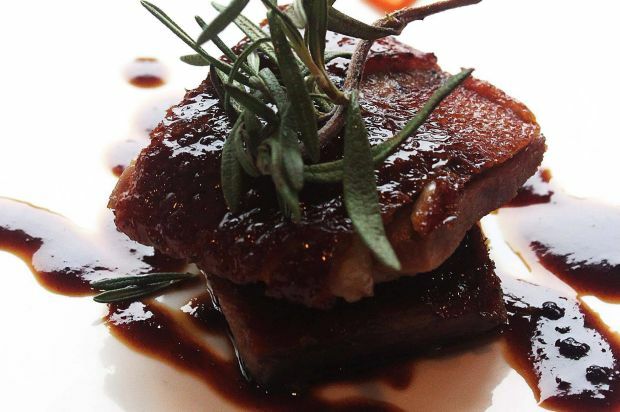 The third dish will be a variety of meat dishes according to the different menus and one is the Roasted Duck with Herbs and Rosemary Sauce. “Rosemary is not a usual ingredient in Chinese cooking but when I tried using it I thought the dish has a very unique flavour,” said Loke. The next dish in the set menu will be the fish dish with the theme ‘Abundance of Blessings’. The fish dishes that will be available in the Wealth set menu is the Steamed Marble Goby in Premium Soya Sauce. For ‘Laughter and Happiness’, a dish to try is the Stuffed Yam with Prawns and Stir-Fried Scallops with Asparagus. The next dish on the menu is ‘Extravagant Fortune’ which is the seafood dish. The Braised Sea Treasures with Garden Greens will be served for the Wealth menu. The last course before dessert is the rice or noodle dish. With the theme ‘Wishes Fulfilled’, the Wealth menu will offer the Fried Glutinous Rice with Dried Scallops. Diners can look forward to two desserts in the Chinese New Year Set Menu. In the Wealth set menu the desserts offered are the Chilled Bird’s Nest with Aloe Vera and the customary Chinese New Year Chinese Brown Sugar Cake with Sweet Potatoes (ninko). The set menu will be available until Feb 17 ranging from RM888++ to RM2,088++ for a table of ten persons.